The first five shots of Ramon Zürcher’s debut film The Strange Little Cat (Das merkwürdige Kätzchen) serve as a kind of miniature map for this relatively short (72-minute), highly unusual work, neatly outlining the spatial compression and sonic misdirection that characterizes its aesthetic approach throughout. (Though in fact, any fragment of Cat could be productively subjected to close analysis and could conceivably serve as a synecdochal emblem for how the film operates as a whole.) After the opening credits (backed by the lovely chamber-pop tune “Pulchritude,” by San Francisco post-rock unit Thee More Shallows), the first shot: a young man (Luk Pfaff) face down asleep on a bed, bathed in early morning sunlight tinted red by a makeshift window hanging. The general ambience is familiar: the bedroom of a now-grown child who has moved away, which has been halfheartedly converted into a utility room but retains a bed for holiday visits. This fellow must be exhausted, because he is dead to the world. He doesn’t stir, even as we hear a cat meowing outside his door. Second shot: the cat, a healthy-looking orange tabby, clawing at the doorframe. The closed door is a problem, because this spare room (and more significantly, its bed) is a customary hangout for her. She grumbles, and then we hear a high-pitched wail. We assume it’s the cat (whose face is turned away from us), but the pitch of the howl is just a bit off. Third shot: cut to the kitchen, where we see the mother of the house (Jenny Schily) wryly looking down at the lower left of the mostly white frame. Fourth shot: her young daughter Clara (Mia Kasalo) looking up at her mother (not in the frame; this is an odd, diagonally organized shot/counter-shot) with her mouth open. She is the one emitting the wail, for no apparent reason, from her seat at the breakfast table. As the shot continues, an unseen male relative begins talking to the mom about the guy we saw sleeping in the first shot. (We learn that his name is Simon.) The fixed frame stays on Clara and her position at the table, while random hands start jutting into the frame, removing dishes from the table. The male voice offscreen, still not properly introduced, is Clara’s dad (Matthias Dittmer). As the fourth shot continues and the parents discuss Simon’s arrival, Clara takes up a pencil and paper, preparing to write while she finishes her toast. As Dad takes a plate away from the table, he says “Milk.” We presume that he is offering Clara some milk, but Clara begins writing, very carefully, “milk…” She does the same when her father says, “Salad.” (Are they making a shopping list? Is Clara taking dictation? A brief conversation later will provide the answer.) A brief mention of a trip to the movies is made. (This too will become significant in a subsequent scene.) Hands and arms continue to enter the frame, removing a bottle and a bag of bread from the table. There is an exchange between Clara and her mom about whether or not to feed the sparrows, which provokes an oddly direct attempt to instill parental guilt. And then, when a garbage disposal is turned on, Clara makes her ear-splitting “cat wail” again. Although not every frame of Zürcher’s film hinges on audio mismatch or playful joshing about with the limits of the film frame, the opening segment I’ve described above (which comprises about two minutes) offers some of the working parameters that will organize The Strange Little Cat. For starters, this is a film that introduces physical spaces and objects and subjects them to various permutations, not unlike a piece of chamber music. Some critics have cited Jacques Tati as an influence on Zürcher, which can certainly be seen in the latter’s sophisticated play with objects. The aforementioned bottle in the kitchen scene, for instance—which will become a recursive motif in the kitchen scenes, which themselves constitute just over half of the film—is introduced so unobtrusively that we most likely don’t even see it until the father’s hand removes it from the frame. It’s not just that the bottle holds no narrative significance until such time as it is removed from the table (it is not a proverbial Chekhovian gun), it’s that it is a cognitively “non-cued” object, the sort of anti-thing that we as viewers tend to tune out of even the most meticulously manicured mise en scène. Tati’s cinema is filled with such miscues, with items so banal—objects as small as hats and umbrellas, or as massive as entire buildings in a widescreen landscape—that they can lie in wait like beige vipers, nonchalantly occupying the frame for minutes at a time without drawing any attention to themselves, until it’s time to “activate” them. 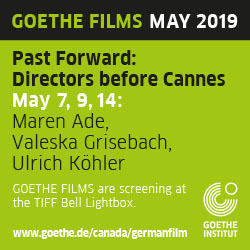 Similarly, Zürcher’s frame contains not just objects of uncertain importance, but individuals whose identity and interrelationships remain strategically unclear for extended durations of film time. In this respect, The Strange Little Cat is most interested in its family as a set of human movements, of comings and goings, and as organizers of space and sound. It’s true that, as Cat develops, we learn more about who these people are and how they connect to one another; the film eventually culminates in a large family meal, and by that time there are more relationships in play, if not a larger unifying context. However, certain of the relationships remain somewhat ambiguous to the very last. In a conventional filmic scenario, this would be considered “bad writing”; here, it’s obviously by design. Zürcher is not concerned with dramaturgy as such: rather, the family members are variables, placed in relation to one another in pairs or sets from scene to scene. This could be why early observers of The Strange Little Cat have been quick to cite Bresson as well as Tati when trying to get a bead on just what Zürcher is up to. It’s true that the relative lack of affect in both the actors’ performances and the characters’ interrelationships could conceivably call to mind the radically exteriorized and automated behaviour of Bresson’s “models”; similarly, Zürcher’s audio play owes something to Bresson’s explorations of the potentials of offscreen sound as both a wellspring of new forms of cinematic meaning and a source of materialist syntax. But Zürcher is taking these potentials in a stark, oddball direction all his own—and if he evokes such lofty comparisons, it’s because his approach is, on its most fundamental levels, so out of step with how narrative film is usually made. 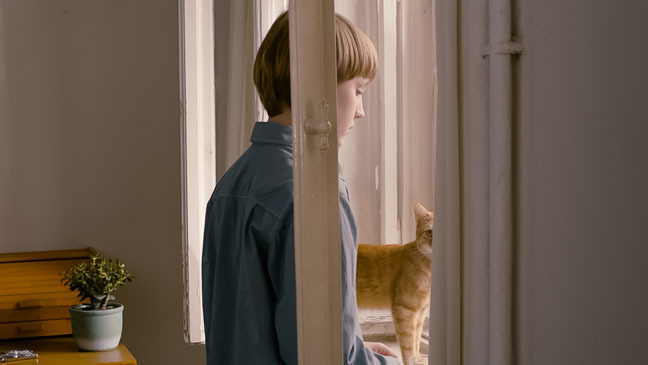 The Strange Little Cat is a film that prioritizes confinement, small movements within that confinement, and the unexpected alleviation of that confinement through imagination and memory; if Tati’s grand subject was modern living and its discontents, and Bresson’s was, to some extent, the articulation of spaces between bodies and things in order to delineate their irreducible singularity, then Zürcher is primarily concerned with the poetry of tight spaces. The first part of Cat is not only about the kitchen (and the kitchen table in particular), but the squeezing, bumping, and negotiating necessary for a large number of people (plus two pets) to manoeuvre around one another and perform their respective tasks. For example, Mom, Dad, and Karin all edge past each other in the frame, their heads cut off by the medium close-up. (It could be argued that this low, fixed point of view, based on a seated position at the table, roughly corresponds to little Clara’s gaze and stature—more on this below—although Cat is not strictly about this.) They all need something in the space, be it the sink, the dishwasher, or some bit of food. After Karin passes her mother, Mom says, “I have a pimple. I wouldn’t have noticed if you hadn’t squeezed by.” At another point in the scene, Dad picks up the cat, Clara tells him to put the cat down, the cat jumps on the table, and then knocks over a glass (heretofore unseen) that rolls off the table, out of the frame, and shatters. People enter and exit the apartment as well as the frame. For instance, an uncle (Armin Marewski) and his son Jonas (Leon Alan Beiersdorf) show up, which also affords us some limited mobility beyond the kitchen. Considering its formal play with familial entrances, exits, and embodied points of view, Zürcher’s work is as indebted to Ozu Yasujiro as it is to Bresson or Tati. But ultimately, none of these points of comparison is entirely accurate. The primary modus operandi of The Strange Little Cat is to convey the simultaneous experience of physical constriction within familial space and the psychological efforts to escape that constriction, doomed though they may be. One way to grasp the general pattern of Zürcher’s blocking and composition within The Strange Little Cat is to observe how he clusters and disperses individuals within the frame, like the application and release of pressure on gas in a chamber; then, when conversations or events do occur, there is a quick cut to an outside point-of-view shot, from the vantage point of someone whom we had no way of knowing was even present in the scene. In this way, even the most relaxed interactions are supplied with a kind of naturalized claustrophobia—the sense that every interior in the family apartment has an immediate, hovering “outside” that is just beyond the threshold. Similarly, the mental escape hatches of recollections and digressive storytelling—the retreat into temporal and spatial realms seemingly beyond the walls of the family home—ultimately find themselves bounded on all sides. Mom’s anecdote about an uncomfortable bodily encounter at the movies temporarily places us inside a flashback, but, of course, the story is about being physically ill at ease, and becoming increasingly hesitant to do anything about it as time goes on. Likewise, Karin’s random comment about how bits of orange peel fall on the ground is visualized by a return (a retreat of sorts) to the airiness of a public park, but immediately before and after the liberating flashback, we see Karin dropping the peels on the kitchen floor, reminding us that she is only “in the park” in her mind. The fact that each of the flashback stories is followed up by one of those eavesdropping POV surprise-cuts only serves as a reminder that the escape the stories provide is wholly illusory. In addition to the narrow interiors and the brief respites of the anecdotal flashbacks, Zürcher offers a third and final presentational mode, one that is almost entirely non-narrative. The film is subdivided into segments, and in between them Zürcher stops to give us a brief reprise of “Pulchritude” and a visual inventory of various key objects that either have been or will be pivotal as physical motifs, or that Zürcher simply wants us to contemplate as filmic entities unto themselves. In the first such transition, we see the “magic bottle” that spins in the pot on the stove, two bags of recycling, a plastic bag, a hot cup of tea, the orange peels on the floor (crossed diagonally by the cat), a moth on the wall, a glass of milk, a pigeon in a tree, and the neighbour kid (Gustav Körner) playing with his hacky-sack. On one level this simply leads us to the next part of the film, where we see Clara putting empty bottles in the recycling machine, but this entr’acte also goes quite a ways toward explaining Zürcher’s somewhat mysterious title. The interlude is not just a clarification, as if one were needed at this point, that objects in and of themselves are the true subjects of The Strange Little Cat (another point of contact with Tati, Bresson, and Ozu); it also represents a clearing of the decks of human dominance, so that we can witness something we might call “feline time.” The cat sees these things, but they have no meaning for her. Rather, they are both foreign (pure entities with no known use value) and absolutely familiar (part of her “turf”). In Freud’s infamous formulation, these things are both heimlich and unheimlich for the “strange” cat. Perhaps, then, separations and mismatches are the dominant mode of The Strange Little Cat because they represent a kind of liberation within a space in which everything and everyone is virtually on top of one another. And whereas more and more people pile into this tiny space, crowding the frame with body parts and half-meant niceties, Clara can still experience everything around her with the kind of wonder that her drab, drained relations cannot. 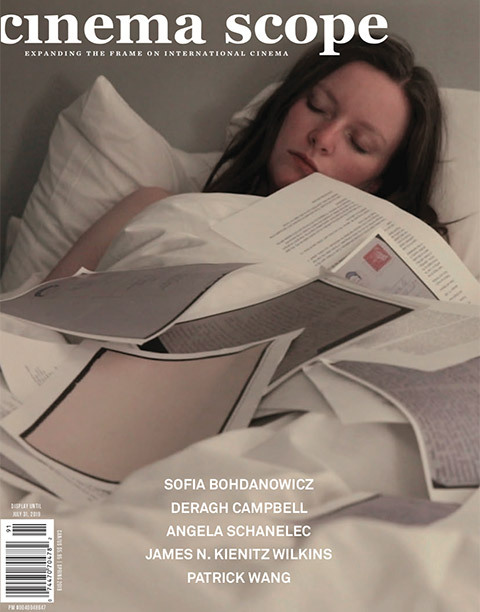 (Her mother’s depressive gaze is the last image of the film; imagine actually living with Bressonian models.) Like the strange little cat, Clara’s world (and Zürcher’s) holds presumed meanings in suspension, and wriggles around at the knee-level of intentional perception.